This document defines the separate pieces of a product template. For the purpose of explanation we use the PCF example tile, a functional tile provided by the Ops Manager engineering team that deploys the NGINX web server. The following is an example of the properties that appear at the top of a product template. Following this example are definitions of each property. String. Required. Must only use alphanumerics and hyphens. The internal name of the product. You must keep the name of your product consistent for migrations to function properly. Changing the name indicates the installation of a completely different product. String. Required. The version of the product. At present you can only import this version into Ops Manager once. If you intend to import the same product / version, you must delete the existing one from the /metadata folder and delete the installation files from Ops Manager’s disk. The version number is important for migrations. String. Required. The version of the schema of the product template, the file that this documentation describes. The metadata_version corresponds to a major and/or minor release of OpsManager. OpsManager can accept a product with a metadata_version that is older than the OpsManager version, but OpsManager cannot accept a product with a metadata_version that is newer than the OpsManager version. It is therefore best practice to set the metadata_version to be the same as the oldest version of OpsManager that the tile version supports. String. Optional. The label that appears in the product tile when it displays in the Ops Manager Dashboard. String. Optional. A description of the product. This is not currently used but may be displayed in a future version of Ops Manager. Integer. Required. The order in which a product tile appears on the dashboard. The BOSH Director always appears at rank 100. For your product to appear to the right of BOSH Director (preferable), you must set this value to an integer less than 100. Pivotal recommends that you set it to 1. Ops Manager sorts tiles alphabetically if all tiles have the same rank. This is a known weak point. String. Optional. This regular expression allows Ops Manager’s Pivotal Network integration to pull a specific product file. You must do this when there are multiple products within the same product slug. Hash. Required. For a list of stemcells, including OS and version, see the BOSH hub. You do not specify which IaaS the Stemcell targets. This keeps your product template IaaS agnostic so that one product template can be deployed on any IaaS. At the time of this writing, none of the BOSH stemcells require a Cloud Provider Interface (CPI). This is expected to change in a future release of BOSH. enable_patch_security_updates allows you to automatically use the latest patched version of a stemcell. This is by default set to true. For products using static compilations, you can disable this feature. If you set the property to false, your product does not receive security patches through automatic stemcell updates. This feature increases security by automatically using the latest patched version of a stemcell. However, operators may experience longer than expected upgrade times. For more information, see Understanding Floating Stemcells. Array of Hashes. Required. A list of product dependencies. If the required product is not present in the PCF installation, Ops Manager lists the needed dependencies and does not install your tile until the dependencies are satisfied. Array of Hashes. Required. The list of releases contained in your product’s releases directory. The version of the release must be exactly the same as the version contained in the release (BOSH releases are versioned and signed by BOSH). Array of Hashes. Optional. A list of variables, that are generated after a deploy succeeds. You can reference variables in a manifest snippet using triple-parentheses expressions. Each variable requires a name and a type. Array of Hashes. Optional. A list of errands that run after a deploy succeeds. Set the run_post_deploy_errand_default: property to on or off to set the default for the errand’s run rule selector in Ops Manager. See Lifecycle Errands. If this property is not supplied, the selector defaults to On. Array of Hashes. Optional. A list of errands that run before a deployment is deleted. Set the run_pre_delete_errand_default: property to on or off to set the default for the errand’s run rule selector in Ops Manager. See Lifecycle Errands. If this property is not supplied, the selector defaults to On. Array of Hashes. Optional. Keys that define global deployment configurations. For more information, see Managing Runtime Configs. Base64 Image. Required. This is the icon that displays on the tile in the Ops Manager Installation Dashboard. Verifiers are configurable settings that contact things outside the tile. For example, given an IP, a verifier can ping the IP to see that it responds. Verifiers are separate from validators, which check whether a string is formatted properly. String. Optional. A publicly available URL that is passed to BOSH in order to download your releases during installation. If you use this field, BOSH Director must have internet connectivity. This allows you to package your tile without releases, decreasing the tile size. Each form type you write is composed of form properties. 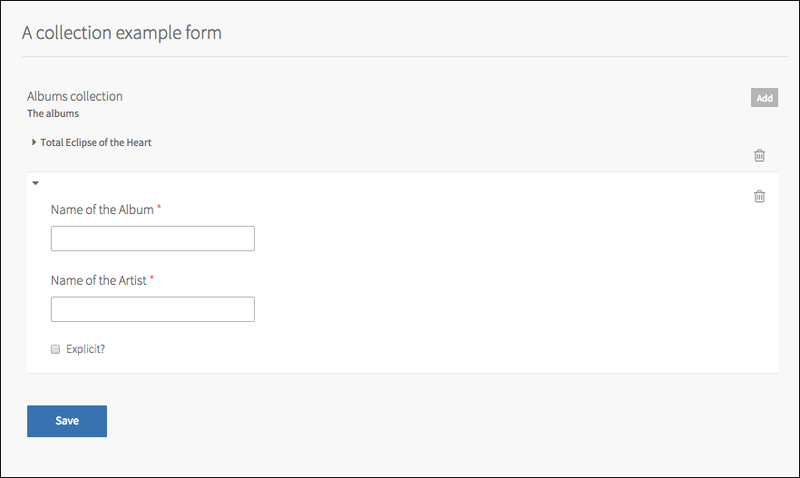 Form properties represent the outline to the form fields that appear in the Ops Manager UI. The name of each form appears on the left-hand side as navigational tabs. String. Required. The internal name of the form. String. Required. The label of the form as it appears as a link on the left hand side of each form. String. Optional. The description of the form. Appears at the top of the form as a header. Markdown. Optional. 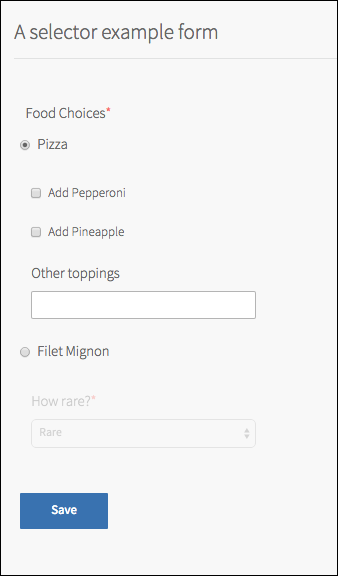 Provide a block of markdown to display at the top of the form. Includes image support. You can use this property to document the tile and provide explanations or references. Array of Hashes. Required. References to properties defined in the property_blueprints section of the product template. Verifiers reach out and find objects in the world. For example, given an IP, a verifier can ping the IP to see that it responds. Verifiers are separate from validators, which check whether a string is formatted properly. For an example of a validator, see must_match_regex. String. Optional. Specify placeholder text for a field. The text appears in light gray to show an example value for the user. The text disappears when the user types in the field and reappears if the user leaves the field empty. Selectors are a means of giving the user a choice of a set of inputs. Collections are a means of giving the user the ability to enter an array of values to create a hash. The following is an example of the property_blueprints that appear in a product template. The example is referenced by the form properties example above. See Form Properties. For more detailed documentation about using properties, see Property Reference. The following is an example of the job_types section that appears in a product template. This section defines the jobs that end up in a BOSH manifest. Those jobs are defined in your BOSH release. Jobs require many different settings in order to function properly, and that is the crux of what Ops Manager does for you: it asks a user for values to those settings and generates a manifest based on what was entered. Ops Manager does not require product authors to provide vm_credentials in the property_blueprints for each job_type. This is because vm_credentials are generated automatically, and you can find them in the release manifest. Note: Starting in PCF v2.1, Ops Manager ignores static_ip and dynamic_ip keys. String. Required. The name of the job as it will be created in the Ops Manager generated BOSH manifest. String. Required. The label of the job as it will appear in the resources page of the tile. The name of the job template to use. Required. The name of the release the template is from. Required. A YAML string defining BOSH links this job consumes. Optional. A YAML string defining BOSH links this job provides. Optional. String. Required. The name of the BOSH release contained in your product archive (.pivotal file). Boolean. Required. You can give users control of balancing jobs across availability zones (AZs) by setting single_az_only to false. To limit a job to a single AZ, set this to true. Integer. Required. A BOSH setting that controls the number of instances of this job that BOSH will deploy in parallel. Note: If you set the default property for persistent_disk to 0, users cannot edit this value and the Resource Config page in Ops Mananger displays None under the persistent disk field. Hash. Required. The number of default instances for a job along with max, min, odd, and the ability to decrease sizing after deploy constraints. If your product uses an external service that performs the same job as a service in Pivotal Application Service (PAS), you can reduce resource usage by setting the instance count of a job to 0 with the zero_if property. For example, your product uses Amazon Relational Database Service (RDS) instead of MySQL, which is the default system database for PAS. Set property reference to .properties.system.database and property value to magic value to change the instance counts of all MySQL jobs to 0. Text snippet, prefaced by pipe symbol: |. Optional. Ops Manager generates a BOSH manifest that defines properties for each job that the manifest deploys. Some of these properties are not set until the user clicks Apply Changes, because the user configures them in the tile or because Ops Manager has to generate them. For more detailed documentation about using double parenthesis and dollar variables, see Property Reference.